An inch or two of snow accumulation is possible by Tuesday evening, especially on non-asphalt surfaces. I can't believe the storm system that brought rain to the Garden State on Sunday (two days ago!) is still with us this morning. As precipitation hung over eastern New Jersey Monday night and temperatures continued to drop, rain changed over to wintry mix and snow. As a result, we already have some light accumulations in coastal counties, with more on the way. As of this writing, the overnight snow is tapering off. Following a few hours of "lull", our next storm system will arrive. A few days ago, I described this system as weak and compact — and that's still a true definition. Light snow will spread across the state again from Tuesday late morning, through the afternoon and early evening hours before tapering off. Again, that's the key word here. This will be far from a major winter storm, with little accumulation, limited to grassy and cold surfaces. Roadways, especially if treated with salt and/or brine, should fare fine for the duration. No wintry advisories or warnings have been issued, reinforcing the mostly insignificant nature of this winter weather event. 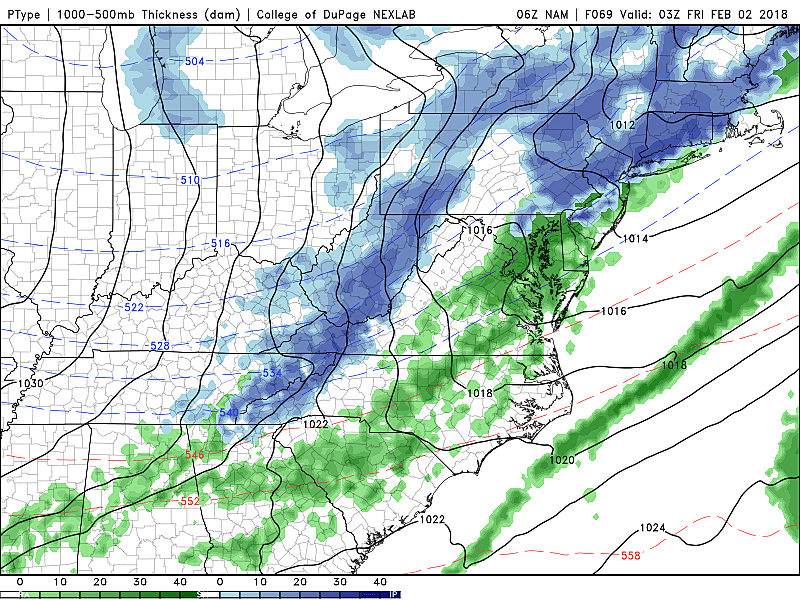 The morning run of the short-range mesoscale models (the HRRR and NAM) play out a band of heavier snow develops sometime in the Noon to 6pm time frame, sweeping from NW to SE across the state. That would suddenly and significantly 1.) reduce visibility, and 2.) ramp up snow accumulations. I still think an inch or two of snow accumulation is a good bet, especially for central, southern, and coastal New Jersey. Local amounts to 3 inches are possible, especially in areas that already saw a healthy coating early Tuesday morning. 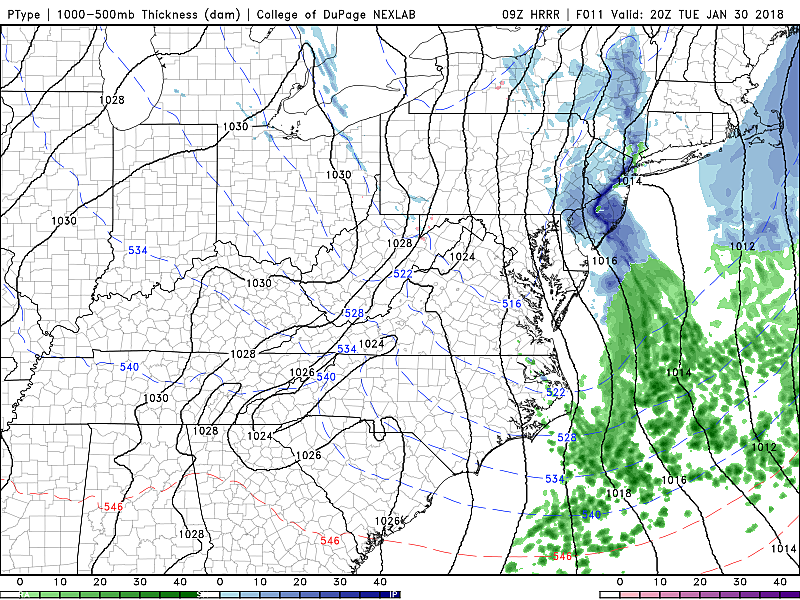 NE NJ will probably end up little to no snow accumulation, as the snow passes to the south and east. The most significant accumulations will occur on non-paved cold surfaces, like grass, cars, roofs, etc. A Coastal Flood Advisory (green) is in effect for the entire NJ coastline through Tuesday morning's high tide. In addition to the snow threat, minor tidal flooding is forecast for Jersey Shore during Tuesday morning's high tide cycle. An extra 1 to 1.5 feet of water could cause flooding of vulnerable roadways — in the "usual" spots. In addition, because of the cold temperatures, flooding may lead to residual ice issues. The minor flooding risk exists for the entire Jersey coastline, from Hudson County to Cape May County to Salem County. As snow tapers off and skies clear late Tuesday night, temperatures will tumble. Look for overnight lows in the upper teens to lower 20s. (Far North Jersey will be colder, in the lower to mid teens.) Wednesday's weather forecast is quiet, but still chilly. Despite some good sunshine, high temps will be limited to the mid 30s at best. We're getting a better handle on the timing of our next storm system, and it favors a warmer, less wintry scenario. Clouds will increase by Thursday morning, as temperatures warm well into the 40s. Rain and snow will arrive around late afternoon Thursday (4 p.m. give or take), lasting through Friday morning (about 7 a.m.) As most precipitation ends before the big cooldown on Friday, it doesn't look like significant snowfall will occur. Maybe a dusting to an inch in colder NW NJ — we'll see how things continue to develop on this one. 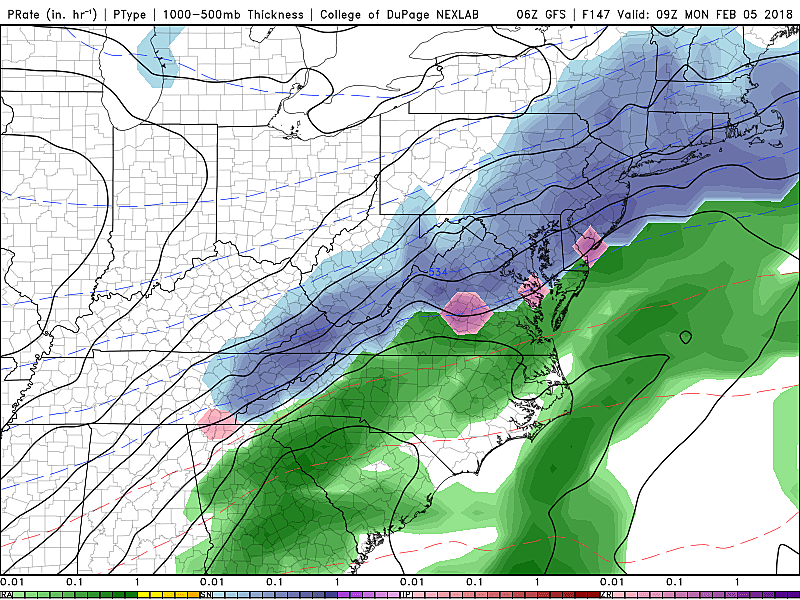 Super Bowl Sunday could start a bit snowy for the Garden State, with a minor burst of snowflakes in the morning. Accumulations will be light. Both the GFS and Euro models are painting a wintry scene over New Jersey for the Sunday night-Monday timeframe, with both long-range models suggesting over a half-foot of snowfall for part of the state. (Notably, their geographies of this max snowfall is very different — GFS bullseyes the NW corner of the state, while the Euro is further south and east.) While a lot can change in 7 days, this one is going to be worth watching through the upcoming weekend. This sure is a busy, wintry forecast! Hold on tight, there's no change in sight to this active weather pattern until about mid-February.